Experience the enchantment of this spectacular ballet in the world-renowned Palace of Fine Arts Theater in San Francisco. ​Over 150 WSPA performers take the stage in this delightful performance. ​​My name is a combination of love (Mahal) and freedom (Malaya). Through art, music, and especially dance, I try to live out the meaning of my name every day. At the age of 3 years old, I took my first ballet and tap class at WSPA and ever since then, I haven’t stopped dancing. At 11 years old, I study ballet, contemporary, modern, jazz, hip hop and Polynesian with Malu Rivera-Peoples, Viktor Kabaniaev, Cristina Fargas, Kira Fargas-Mabaquiao, Maia Siani, Matthew Montenegro, Jessie Munoz, Katrina DeJesus, and Stephanie Patrick. Along with my training at WSPA, I also combine my love for dance with the love for my culture. Since 2011, I have been also performing indigenous dances of the Philippines with the Parangal Dance Company. I recently performed my own interpretation of “Bayan Ko” accompanied by BarPa, a live Rondalla Band at the Pistahan Festival. Last year, I was invited to dance at the “Lumipad” show at the Alvin Ailey Theater in New York City. I was also very fortunate to be a featured dancer in the documentary “Sayaw.” And since I was born, I have been raised in a community called in Pin@y Educational Partnerships (PEP) where I learn about Filipina/o American history, culture, and activism. I’ve been so lucky to share my own choreography at events like the San Francisco Pinoy Arts Festival, the Free Minds Free People Cultural Night, and the Pinays in the Arts Show. Last year, I also danced in the “Tour de Force” video to promote healthy living. Along with my love for performance, I am also passionate about social justice, service, and academics and I value my family, my friends, and my community(ies). 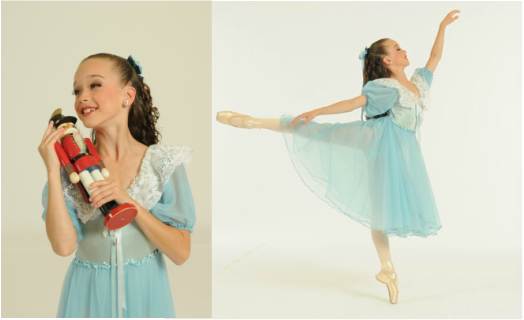 I’ve come a long way from my first performance in the Nutcracker as a “Baby Angel” in 2009 and it is an honor to perform the lead roles as “Clara” and as a “Butterfly” in this year’s Nutcracker. Every year that I have danced on the Nutcracker stage has been a blessing and I’m reminded that dreams can come true! 2014-2015 Awards: This past year Mahalaya won the Mini Outstanding Dancer title at the New York Dance Alliance Regional Competition in Santa Clara and received 1st runner up at the nationals in New York City. She received the overall highest scores for her solos and duet at the Spotlight Dance Cup. She was just awarded a full scholarship to attend the American Ballet Theater’s intensive program. When I was little I was really into sports, especially Soccer. I wasn’t interested in dance, but after seeing my older sister Jadyn dance in WSPA’s “Nutcracker”, I was certain I wanted to dance too. When I was 6 years old, I started dancing at WSPA in a ballet and tap class with Ms. Reina Victoria. I have loved dance ever since. Just a year later, I auditioned for the performance program and made it! That was also the year that I started dancing in the Nutcracker. That first year, I was lucky to get two roles; one as a tiny baby angel and the other as a scary, hilarious mouse. I had a lot of fun doing them both. Now, at 11 years old, I dance almost every day. I’m in the Professional Ballet Program and I also take jazz, modern, tap, hip-hop, and Polynesian. I am currently working on four solos; two in Ballet, one in Modern, and one in Jazz. I love dancing because it is fun and I have many friends doing it with me. Currently, I’m in 6th grade at Good Shepherd School. I also enjoy running. Last year, in Junior Olympics Track & Field, I won the 50 and 100 yard dash and was invited to compete at the State level. Along with physical activity, I love doing art and crafts. It makes me happy to make things and share them with my family and friends. In 2014, I was in a short film called “Dancing with Nureyev”. In the film, I danced alongside my professional ballet teacher, Viktor Kabaniaev. I have also been given many opportunities over the past year to share my ballet and lyrical solos in various competitions. At the Onstage Dance Competition, I received multiple awards including recognition for my stage presence and a regional scholarship. I was top twelve in Contemporary Dance at the Youth American Grand Prix. Then at NYCDA’s regionals in Vancouver, Washington, I was one of the mini Outstanding Dancers. Finally, at Showstoppers, I received a Crystal Award for dancing my Modern solo “Spanish Rose”. Sabrina has been dancing since she was 5 years old. She attended ballet classes at CPAA Arts Center, San Francisco Ballet School, Bayer Ballet Academy, and is now studying under Mr. Kabaniaev in the ballet professional division of WSPA. She performed in several different productions, including San Francisco Ballet’s Waltz of the Golden Hours in Coppelia and the Nutcracker as a clown and a butterfly, as well as lead roles in Bayer Ballet’s winter and spring shows. In WSPA’s 2013 Nutcracker, she was a butterfly, and in 2014, she was the role of Doll and the Sugar Plum Fairy for the first time. This year Sabrina is grateful to dance the role of Sugar Plum Fairy on Saturday and Monday shows. Sabrina received multiple summer intensive scholarships and was invited to study year round in the Bolshoi Ballet Academy of Moscow and the Kirov Academy of Ballet in Washington D.C. after attending their summer programs. She won 1st place in Youth America Grand Prix’s SF regional Junior Classical Division in 2015 and 2nd place in 2013. She also won the Gold Medal of World Ballet Competition 2015 in the pre-professional category this past summer. FaSabrina’s advise to any young dancers would be to enjoy what you do and keep pushing yourself to be the best you can be! ​Alyssa started dancing at WSPA at the age of three and has been a member of the Ballet Professional Division since its inception. In addition to classical ballet, Alyssa also trains in modern/contemporary, jazz and hip hop. She has represented WSPA in several competitions including YAGP, WBC, NYCDA, IDC and Showstoppers. She placed in YAGP’s Top 12 in the junior division and was an Outstanding Dancer runner up at the Santa Clara NYCDA regional finals for the past three years. 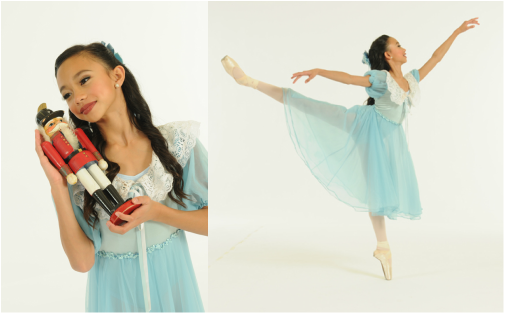 Alyssa has participated in the New York City National Finals for both YAGP and NYCDA and last year travelled to the Philippines to participate in Ballet Philippines’ 45th Anniversary Homecoming Gala. Alyssa has previously performed the roles of Clara, Dancing Doll, Chinese Lead and Butterfly and she looks forward to performing Snake, Snow Queen and Princess Flora in this year’s production. "Rudy Candia joined Silicon Valley Ballet (then known as Ballet San Jose) in 2006 and has performed many leading roles with Ballet San Jose including Don José in Roland Petit's Carmen, Albrecht in Giselle, Prince Siegfried in Swan Lake, Romeo in Romeo and Juliet, Prince Vladimir in The Firebird and the Tsar in Dennis Nahat's The Nutcracker. He was a member of the S.O.D.R.E. Ballet Company in Uruguay, where he performed classical ballet repertoire beginning in 1996. Mr. Candia joined the Carolina Ballet in 2001, and performed soloist roles in A Midsummer Night's Dream, Inscapes, Prodigal Son, Carmen and The Nutcracker, among other works. Born in Havana, Cuba, he began his study of dance at the Provincial Ballet School. In Montevideo, Uruguay he trained at the Uruguayan National Ballet School beginning in 1996. Both his parents were principal dancers at the National Ballet of Cuba." From: "Rudy Candia." Silicon Valley Ballet. N.p., n.d. Web. 19 Nov. 2015. <http://siliconvalleyballet.org/rudy-candia>. "EJ’s formal dance training began in 2001 in North Fundidor, Molo, Iloilo City. He entered the Philippine High School for the Arts scholarship program in 2004 and graduated with an Artistic Excellence Award. In 2007, he was a finalist at the 2007 NAMCYA Junior Ballet Category. Joining Ballet Philippines as a scholar in 2008, and already then having the chance to dance in key comapny productions even as a scholar, he quickly rose the ranks of the company after sucessfuly portraying lead roles becoming a member in 2010, a soloist in 2012, and a principal dancer in 2013. Some of his most notable principal performances with the company in modern works include the title character in Crisostomo Ibarra, Luyong in Pusong Wagas, Andres Bonifacio in La Revolucion Filipina and Rock Supremo, the Groom in Norman Walker's Songs of a Wayfarer and the solo in Max Luna's Cold Song. In classical ballets, he has portrayed Espada in Don Quixote, Albrecht in Giselle, Prince Desire in Sleeping Beauty and Prince Charming in Cinderella. For his roles, he won 2 Gawad Buhay awards: the Male Featured Performance in a Modern Dance Production Award for Rama Hari in 2013, and the Male Featured Performance in a Modern Dance Production for Rock Supremo in 2014." 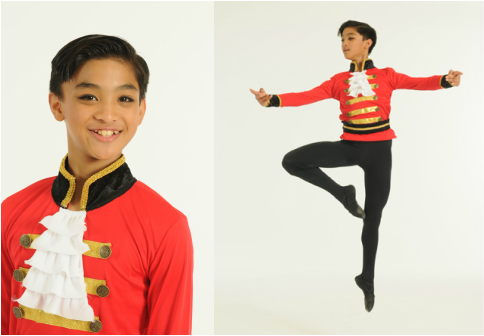 From: Earl John Arisola at: http://www.ballet.ph/company/arisola-earl-john (Accessed: 24 October 2015). Ian started dance at the age of 4, and is currently in the Ballet Professional Division at WSPA training under Viktor Kabaniaev. He enrolled in the Ruth Asawa School of the Arts (SOTA) Dance Department this summer where he also trains in ballet and contemporary. He attended Joffrey Ballet School summer intensive in 2012, and he attended City Ballet School of San Francisco’s Boys Program under Nikolai Kavaniaev in 2014, and in Bravissimo Dance Studio under Jorge Esquivel this past summer. He was proud that he was chosen as the best junior student at WSPA in 2013. He has won several awards in regional and national ballet/dance competitions. This is his 11th year with WSPA’s nutcracker. He has performed as Fritz, Young Prince, Russian lead role. He is excited to play the Snow King for the first time this year. ​Jonacy started dancing in the Party Scene of the Nutcracker at the age of 4 and began taking classes in ballet two years later. Soon after, he became a member of the Performance Program in ballet, modern, tap, jazz, Polynesian, and musical theater. He has competed as a Polynesian soloist since the age of 5 and has garnered several top awards in Manahere, Tarena Tahiti, Heiva I Reno, and Tahiti Fete. Jonacy began competing as a soloist in ballet and contemporary two years ago and has received top awards at Youth American Grand Prix, New York City Dance Alliance, Showstoppers, Spotlight, and Onstage. His most recent accomplishments in 2015 include 2nd place in Classical (male) and Top 12 in Contemporary Junior Division at YAGP and Regional Junior Outstanding Dancer and 1st Runner-up National Male Junior Outstanding Dancer at NYCDA. Jonacy currently trains in the Ballet Professional Division and is a Company member of the Ballet, Modern, Jazz, Tap, and Polynesian Performance Programs and is a member of APT. 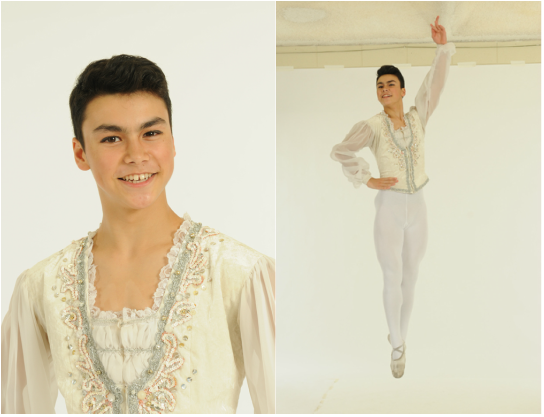 Jonacy has previously been a mouse, trumpeteer, Fritz, and Russian in WSPA’s Nutcracker. This will his 3rd year performing the role of Young Prince in the Saturday show. Kyawzwa Lwin first began dancing at WSPA at the age of 3 under the influence of his older sister. He was recruited to play one of the children in Nutcracker party scene by Ms. Tina. Since then, he fell in love with dance. He started training in several different dance genres such as ballet, tap, jazz, lyrical, and hip hop with Ms. Malu, Ms. Tina, Ms. Amy, Miss Michelle, Ms. Maia, Matt and Jason. At the age of 8, Kyawzwa received scholarships from competitions such as New York City Dance Alliance and JUMP. In 2015, he was awarded “Regional Junior Outstanding Male Dancer Runner-Up” by the New York City Dance Alliance as well as being ranked top 12 in contemporary in Youth America Grand Prix regionals. 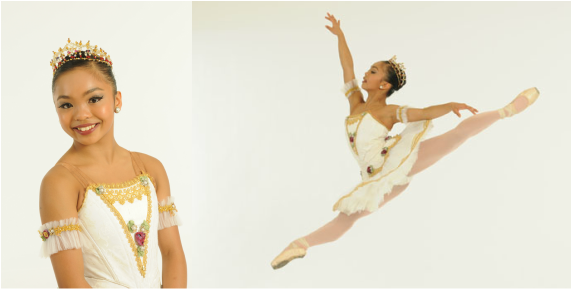 Kyawzwa is 12 years old and is currently training with Mr. Viktor in the Professional Ballet Division. 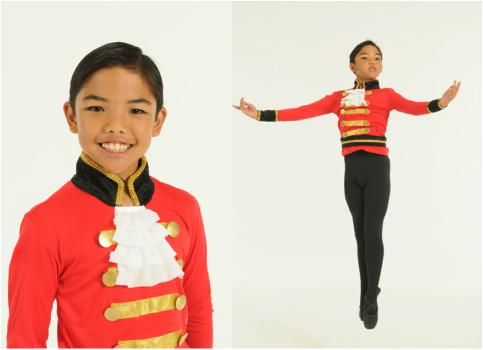 He is very excited to be portraying as Young Prince, one of his dream roles, in this year's production of Nutcracker. His previous roles include Mouse King's Assistant, Trumpeteer, Swordsman, Russian Lead, Fritz, Drummer Boy and Dew Drops of Waltz of the Flowers.